I recently put together some information and links for a Galaxy Express passenger interested in learning more about sci-fi romance. Afterwards, I was like, hmm, maybe someone else might come along needing the same information. Clearly, the content wasn't visible enough since it was buried among several older TGE posts. Plus, a document would be much more convenient to share and easier to navigate. 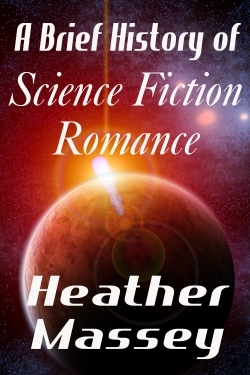 A BRIEF HISTORY OF SCIENCE FICTION ROMANCE is available at Smashwords. After you download it, you can share it freely. In the future, I'll make the ebook available as a free download on my author site. We have the power to course correct the traditional narrative about the role of women in science fiction. One example of this is Kristine Kathryn Rusch's project, Women In Science Fiction. And technology helps us amplify our voices, so let's use it!